I hope you have your cuppa tea/coffee and are ready to sit back, relax, and enjoy a sweet short story. I am back in Jeddah Writing Club and the October meeting was a resounding success. We met at the lovely Voila Cafe, acclaimed for its different kinds of hot chocolate. The member’s shared amazing pieces, the topic was ‘Bookshop’ aka every writer’s/reader’s heaven! My inspiration was the the bookshop owned by Meg Ryan in the movie ‘You’ve got mail’ (one of my all time favourite movies). Yes its cheesy, I like cheese! Cheese is good. In moderation..of course. I confess I wrote my piece on the day and the end in the car so as far as writing goes it is nothing spectacular, but I got positive feedback, I think its a good fun read especially if you know the references ;-). It was a second-hand bookshop, the kind where they let you sit undisturbed in the corner or on the overstuffed couch or the big chair by the window. The kids would be gathered around the owner reading out stories for the little ones sprawled on the rug or bean bags. The smell of homemade chocolate chip cookies wafted through the shop and milk was the fashionable beverage of choice. I used to buy the C.S Lewis Narnia series and sit there reading them. I’d be back again to sell my old book and buy a new one. It was almost like a library. Except libraries were such cold dreary places for adults. No atmosphere. It was here that my imagination thrived in the fantasy world of Harry Potter, and Terry Pratchett. It was here that I went through my tom-boy phase where I read heart stopping thrillers oblivious to those around me. 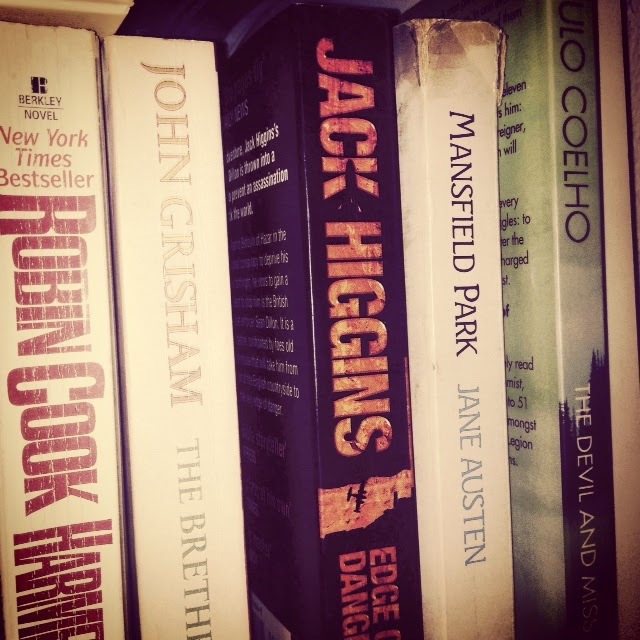 John Grisham, Robert Ludlum, Jack Higgins I read them allwhile sporting my short hair and Doc Marten Boots. It was again here where I discovered my feminine side with Jane Austen and what it was to be completely involved in a romance to have words make you tingle and smile . The note at the end of Mansfield Park by Jane Austen was signed off from Edmund to Fanny, so sweet, I thought. I found the notes fantastic… And they added to the excitement of finishing the book. Sometimes there were tiny trinkets or charms tucked into the note in the cover, all in the theme of the book. As I grew older I bought a book from the Mills and Boons series and instead of the last page on the first page there was a note. I remember I dropped the book and as I was still in the bookshop and I immediately exchanged it for another one… I didn’t know the nameless faceless writer. I thought sometimes it was the lady who owned the shop or her daughter who usually served me that they wrote notes for all their regular customers. The summer before uni started, I read Paulo Coelho’s The Alchemist and I remember clearly the note asked me to hold true to my values and not let others change me, and hoping that the new experiences and studies would not put me off reading for pleasure by next summer. I had kept the book and taken it to uni with me. As I packed my things at the end of the semester my roommate was helping me and she dropped the book and out fell the note. She read it and with raised eyebrows and a wicked smile. And she launched into a million questions, and I have to admit the more I told her the more I realised it was a bit odd. Maybe for once my roommate’s imaginary romantic scenarios involving me did exist. She was always imagining things like the coffee guy gave us free cupcakes the whole year coz he had crush on me. (I told her it was a special offer, she told me the offer ended in September and we were now in June- whatever-she was crazy). I went back home that summer as usual looking forward to reading and visiting the book shop but a bit more intrigued the next book on list had been Mansfield Park-again. I have been an Edmund to you in the only way I could be (given that we are unrelated) through books and little notes. I want to know now that you are all grown up and may I add you’ve turned into a lovely young woman would you consider giving me a chance to ask you to be mine. I want your book to me mine to be read for the first time to be the one to pull apart the uncut pages. I want to read you every day for the rest of my life never will you be borrowed or end up in a second hand bookshop like this one. I want to touch your brand new smooth white pages and I will love them even more when they are yellow and dry. I want to inhale your magazine like freshness and I will love it even more when it is has the scent of an old book. I know until now you have lived and loved through books. But now I want you to live and love with me, through me. It may not be as perfect as on paper, but it will be more powerful. Take your time. If there is someone else or…if you don’t want to I will understand. Otherwise meet me in the classics aisle on 18thOctober 5 pm. I looked around I could spot no guy watching me. I ran all the way home feeling flustered. I felt shocked, annoyed, betrayed. But once I calmed down I realised,that he, whoever he was, had done me no harm, in fact he had only wished me well, helped me grow, molded me into the person that I was today. I met him , after all how could I not and later I married him. If you enjoyed the piece don’t miss out on future posts enter your email address top right corner ^ and keep in touch on Facebook, Instagram and Twitter. I think it is every booklover's dream to find someone who shares their passion, and is actually good with words. I hope men like this exist outside of fiction! Lol.